Your Brand is Our Bag! Custom printed bags receive an average of 5,938 impressions each throughout their lifetime. Choose one of our awesome reusable bags to have custom printed with your company name and logo, and see just how much of a difference these bags can make to your business. Increase visibility, build brand recognition and improve your reputation. The reusable wine bag is another great initiative within this industry that allows people to go green with their daily habits. Indeed, if you want to show your customers you are eco-responsible, then this bottle bag is an absolute must have. Made from a non-woven durable material, this is most popular for wineries, wine shops, liquor stores, marketplaces & restaurants. Choose from all sizes of ink-printed natural or kraft paper options. Paper has classic appeal and crisp lines, and kraft paper holds up under a variety of conditions. We offer a range of bags that hold from one bottle to four, so no matter what the occasion, you can find a bag that supports the purchase or gift. Compact and sleek designs in with multi-functions and colors. 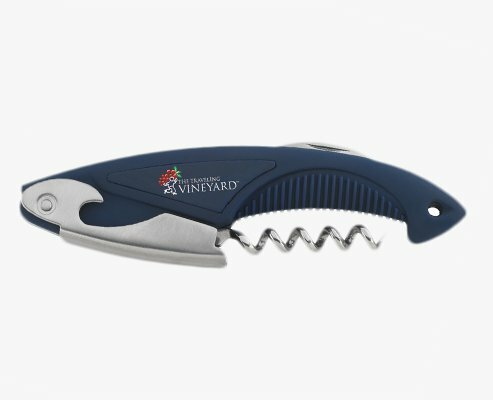 We have a range of corkscrews that can be custom designed to meet the needs of your winery or even any business that wants to provide these as gifts to clients or customers. Crafting a beautiful, well-stocked tasting room is a prime move. 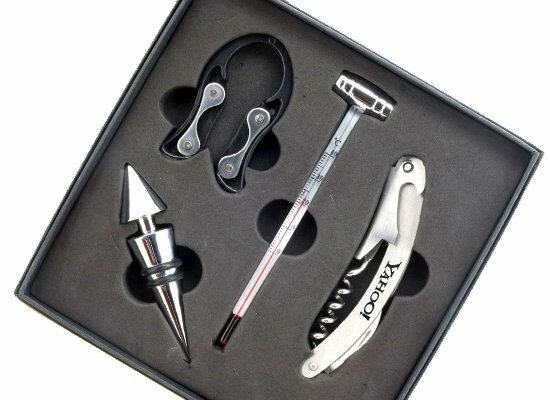 Stock your tasting room or supply your wine club members with these awesome winery approved promotional items. We've consulted with some of the best tasting room managers to bring you what they approve! 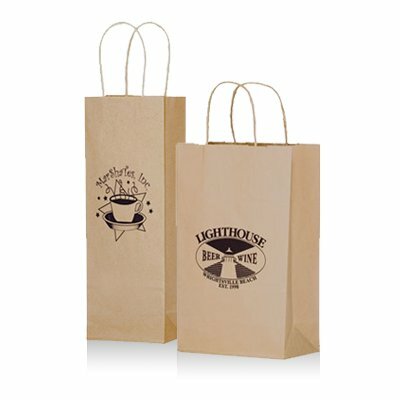 If you are a wine seller, you should consider adding wine bags or totes to your product line. Selling wine bags and totes alongside your wine inventory makes excellent business sense. American businesses give away $20 billion worth of products with their logos. They do it for a reason. Exactly 82.6% of people remember the name of the company and brand on a promotional product. 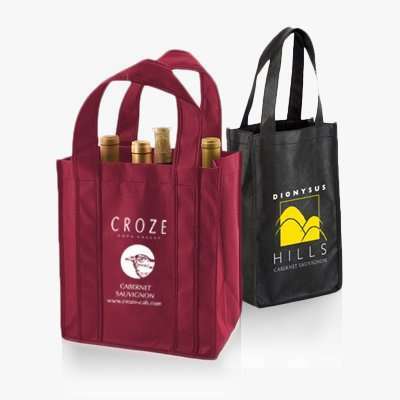 With your company logo on the wine bag, your customers are sure to remember you. Research also shows that selling your customers a wine bag with your logo on it will make them more likely to buy wine again. People tend to remember promotion logos on an item that is related to a prior purchase. Imagine having free advertising all over the region you cover. That is just what having your logo on a tote bag does for you! Put your logo on the bag, and your customer will have a reminder of where the wine came from for years to come. People also will notice that your company is environmentally responsible because you provide clothe wine bags rather than plastic bags. According to the study cited above, a promotional item in a consumer’s hands is a better form of advertising than TV, print or online advertising. People tend to remember the name of the company better with the promotional item than from an ad via electronic media. The survey stated that 83% could remember the company that was doing the advertising. Further, when consumers see and use a promotional item, they tend ot have a more positive reaction the company. In the survey, more than 50% of those who had gotten a product with a promotion on it had gotten a positive impression with the company, as opposed to 33% who had seen the print ad. Many of your customers are going to take their bottles of wine somewhere: to a party or picnic or holiday gathering. Having a handy, attractive tote bag to carry the wine in is a great convenience for them. Bags and totes are much more easy to carry than a wine box. Also, the weight of the bottles are distributed evenly in the bag, which makes it easy to carry. 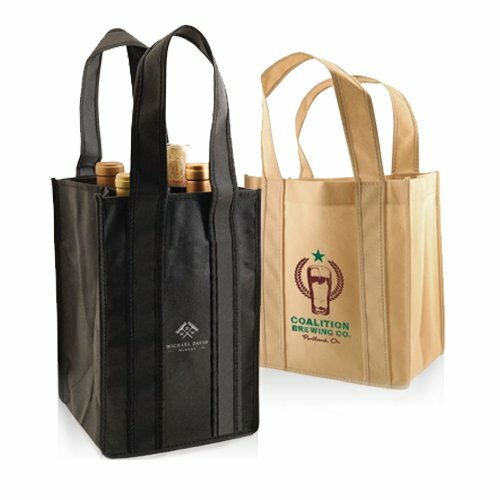 These bags are available typically for one to four bottles of wine, so your business can have wine bags on hand to meet most customer needs. Wine bags and totes also can be used by customers for many other purposes. For example, they can be used to carry other types of drinks to a party. or, they can be used to carry crafts. Also, a wine bag can be used to store and carry cleaning supplies for the house. Many customers decide to buy a bottle of wine as a gift, and a great way to package it is in an attractive wine bag. People who receive the wine and the bag really are receiving two gifts, and the second one has your company’s name on it. The positive feelings they have about the attractiveness of the bag and its convenience will be extended to your company. The customer often is going to carry the bottle of wine in the tote to a party or gathering. This means that many more people are going to see the name of your company on the bag. The wine bag is a wonderful way for many people to be exposed to your product. Wine bags are better than plastic bags or cardboard boxes and can be used repeatedly. Most plastic and paper bags are thrown away after one use. Also, the wine bag is much more durable than paper and plastic bags. Reusable wine bags are particularly popular for as wine and beer bottle carriers and usable up to 300+ times. They come in a multiple of colors, and imprintable with up to 4 colors on two sides. Be sure to carry, stock and use wine bags and totes to boost your business’s visibility, and to provide other important benefits to your customers. Ideal for trade shows, wine stores, shops, liquor stores and other promotions where you want to reinforce your brand.